Carl Fredricksen was fascinated by Charles Muntz, a wilderness explorer, as a young boy. 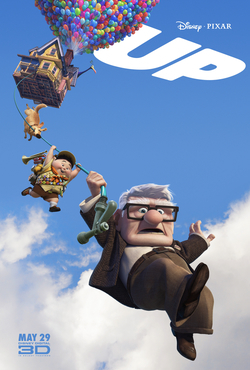 Now, as an old retired balloon salesman, after his wife’s sorrowful death, he seeks for the adventure that he had always wanted to have- a trip to South America. He ties hundreds of balloons to his house and sets it afloat. He creates sails and wings to navigate the flight. At this time, to his utmost surprise, he hears a knock on his door when he is afloat. When he opens, he is even more surprised to see a small boy named Russell, who is keen on becoming a ‘Senior Wilderness Explorer’ in his porch. Together, Russell and Fredricksen, who is a little discouraged at having Russell with him, steer themselves on the vast sky and land in South America(by accident). Russell becomes friends with a 13-foot giant bird and calls it Kevin, and also a talking Dog named Dug. They meet Charles Muntz in his lab in the wild, and realize his wicked aim of wanting the bird- Kevin- as a part of his collection. Old Fredricksen, young Russell, and Dug the Dog do away with the villain and save Kevin from the treacherous villain- Muntz. They restore Kevin back with its kids and set off on a journey back home. Russell is declared a ‘Senior Wilderness Explorer’. Carl Fredricksen achieves his lifelong dream of travelling to South America. And Dug the Dog finally gets a master! All is well. The movie is fantastic, and I feel it is a must-watch film. The part I enjoyed the most is when Fredricksen finds Russell standing in his porch while the house is afloat. The shock, the surprise, the irritation and amazement- it’s all there then.